VOL. I NO. 38 REG. NO. L5015 DELHI, THURSDAY JUNE 3, 1943. SATISFACTION TREBLED Cheesecake fans get triple their usual artistic satisfaction today. 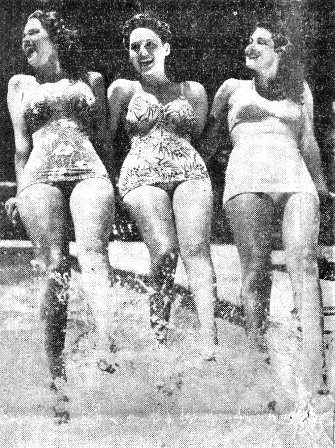 The three lovely starlets wriggling their toes in a Hollywood swimming pool are, left to right, Frances Rafferty, Dorothy Morris and Vicki Lane. Nice looking toes, aren't they? ASSAM AIR BASE - Like ghosts out of the night, two men given up for dead over a month ago staggered into this camp. They struggled back 46 days over the pathless Tibetan mountains after crashing into a snowfield on a 14,000-foot peak. LONDON - Lt. Gen. Joseph W. Stilwell, commanding general of U.S. Army Forces in the China-Burma-India Theater, arrived recently in England to discuss further military operations after attending conferences held in Washington with President Roosevelt and Prime Minister Churchill, reported U.S. Army HQ here. Stilwell went into conference immediately with Lt. Gen. Jacob L. Devers, commanding general of the European Theater of Operations. Other conferences followed with heads of the British Army, the RAF and other war agencies. Stilwell then conferred with Maj. Gen. Ira C. Eaker, commanding general of the U.S. 8th Air Force. and the AVG, and Capt. Ridge Hammell, 24, Philadelphia, former Pan American pilot at Oran, North Africa, encountered bad weather over the Himalayas. Rosbert said, "When the windshield iced five inches, we turned back. The gale blew the plane 65 miles off its course. When a rift opened in the clouds, we glimpsed the mountainside a few hundred feet ahead, pulled up the ship's nose and crashed on the snowclad peak. The Chinese radio operator was killed instantly, my ankle was broken and the co-pilot's ankle was sprained." Hammell commented, "For five days we shivered in weather far below zero, wrapped in our parachutes waiting for our legs to improve. On the sixth day, running out of six small tins of food, we tore out a plank at the bottom of the plane and worked our way to the edge of the mountain. We started sliding down the side, 30 miles, and reached the treeline. We huddled in a cave overnight. For seven days, we hobbled, following river gorges and lowering ourselves over precipices. We were without food, eating raw, dead birds. Eight days later, we arrived at the house of a Mishmi - a mountain tribesman. At his bamboo hut, we ate uncooked corn. I never tasted anything so good as those corn kernels." The pilots continued, "For three weeks we lived at Mishmi's hut, learning the language, smoking tribal tobacco and opium, nursing our injured limbs. One day, the head man of a distant village arrived telling a tale of a British survey expedition making its biannual trip. It was four days off. We sent back a note and received a reply that a doctor and supplies were coming. The letter was like a package from home. We traveled with the expedition. It wasn't easy going, sliding over river gorges, going through bamboo jungles, crawling down mountain shelves. We were carried on the backs of the genial, unselfish tribesmen. "Here at the base tonight we are going to rest a few weeks and get surgical treatment. We expect to be back on the job shortly." Capt. Charles Sharp, Fort Worth, Tex., operations, remarked, "CNAC has been flying China's mountain-studded airways for 13 years and this is the most fantastic story I've heard yet." 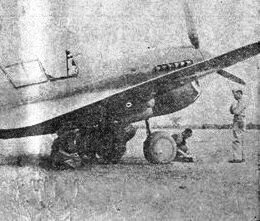 Adverse weather conditions curtailed the mounting offensive of the 10th Air Force against Jap-held Burma during the period of May 23-31. But whenever bombers and fighters could range over enemy territory, they continued to wreak havoc by bombing and strafing. MAY 22 - A heavy bomber on reconnaissance sighted a 150-foot vessel in the Gulf of Martaban, sank same. Two formations of B-25's attacked warehouses, rolling stock, engine sheds and tracks at Kanbalu. During the night, heavy bombers attacked Prome, Rangoon and Mandalay. 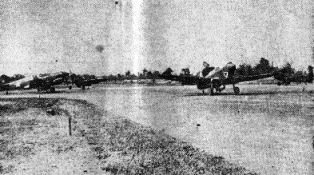 MAY 24 - Despite bad weather, medium bombers struck at the sawmill and powerhouse at Monywa and the railroad yards at Thazi, while fighter-bombers bombed and strafed barracks at Kamaing and Washawng. MAY 29 - Fighter-bombers, armed with medium demolition and fragmentation bombs, took aerial punches at the storage huts at Sumprabum and buildings at Kamaing, and strafed in the Singban-Maingkwan area and at Nanyseik. MAY 30 - Fighters strafed Kamaing, Sumprabum, Taipha-Ga and Yupbang-Ga.
MAY 31 - B-25's struck at Mandalay, Monywa and Legyi. Warehouses, rolling stock and tracks were hit at Mandalay. Visibility mitigated against assessment of damage done to other targets. Fighter formations made numerous sorties during the day. CHINA AIR BASE - Latest additions to men in the Theater who have walked home from a plane ride are four officers and five enlisted men of this bombardment group. They are Lts. David L. Willis, Junior G. Hull, Chris H. Williams and Russell J. Green; S/Sgt. Stanley L. Marshall and Sgts. James E. Johnson, Carl C. Burgees, Arthur B. Franklin and Irvin R. Howland. The nine were members of the crew of a bomber which was forced down recently in Free China by mechanical difficulties. Thanks to Chinese civilians, who acted as guides, they are all back at their base, safe and sound. The men of this group extend congratulations to three of our officers who recently exchanged their railroad tracks for gold maple leafs. We're proud of our three new majors, Horace G. Foster, Henry G. Brady and Paul J. O'Brien - all crack pilots. Congratulations, too, to the enlisted men who were promoted recently. CHATTER: One of Winchell's orchids to the officers and enlisted men for their contributions toward aiding the residents of a Chinese village bombed by the Japs. Without promoting, they came forward to show their sympathy for the innocent victims of Nipponese wrath... Gin Rummy seems to be losing its popularity with the enlisted men, although a tournament conducted recently by Lt. Mark M. Conn and his assistant, Glen Zimmerman, proved a success. S/Sgt. Nat Accerman, of good old Brooklyn, who claims the championship of India, was entered but lost out early. S.Sgt. 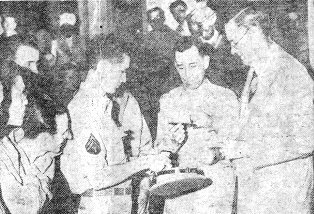 Jacob Moore, one of Texas' contributions to the Army, won the title and the cabbage. "Dirty Eights" is the latest pasteboard activity to intrigue the G.I. 's and is costing T/Sgt. Stan Hodges a pretty penny... A banner turnout was reported recently for the showing of Lure of the Islands, starring Margie Hart, known to patrons of the arts as the "poor man's Garbo"... Sgt. Buck Yeatts, of Chatham, Va., suh, denies being first in line to see the film. Willard (Bill) Smith, popular topkick of one of the squadrons, is with us again and, needless to say, we're glad to see him on the job. Another first sergeant, Nick Continisio, is also with his outfit, joining Frank Denson and Clarence McGrath in the orderly room... Enlisted men of headquarters finally defeated the officers in softball, but not without a struggle... It was one of those pitcher's battles, the final score being 14-12. Capt. Joseph J. Morrone and Lts. James E. Maher, Mark M. Conn and John S. Powers shared the twirling for the losers, and M/Sgt. Joe Ceglie hurled for the winners. Many thanks to you and your associates for that fine letter of March second, written in behalf of the Victory Club Committee and the Armed Forces of the China Air Task Force. Permit me to assure you of my heartfelt appreciation of the check which you enclosed in the amount of $632.15, payable to the order of the Warm Springs Foundation. Please assure all the contributors who have made this donation possible that I have been deeply touched by such generous support of a work very dear to my heart. CHINA AIR BASE - 1st Sgt. Genneth G. Falkner, of this China-based medium bombardment squadron, received a personal letter this week from his Commander-in-Chief. 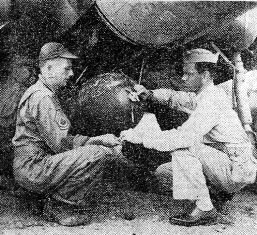 Acknowledging the receipt of a check for $632.15, representing the money raised by a Birthday Ball dance under the sponsorship of the Victory Club committee at this base, President Roosevelt wrote the letter at right. (Note: Falkner is president of the Victory Club Committee, which, in conjunction with the American Red Cross, operates a service club for enlisted men at this base). 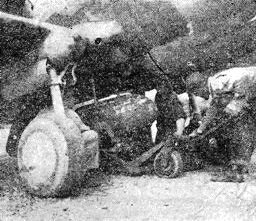 CHUNGKING - Allied planes downed 23 Jap aircraft and damaged eight others in a battle over Ichang that followed effective bombing of Ichang by the 14th Air Force. Chinese HQ announced that five Jap divisions are surrounded and doomed in the Changyang area south of Ichang. The Chinese counter-attacked and recaptured the key mountain pass of Yuyang Kwan, 40 miles south of Ichang and have driven to within seven miles of Changyang. Meanwhile, China is saddened by the report that President Lin Sen, 81, has suffered partial paralysis as a result of a stroke and is probably on his death bed. The 14th Air Force, operating in collaboration with Chinese air and ground forces in the Tungting Lake and Yangtze river areas, recently attacked two important Japanese supply and troop concentration points. 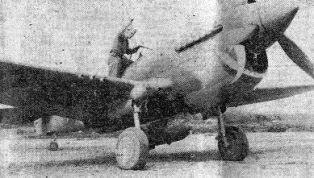 Warehouses, railroad yards and rolling stock at Yochow (Yoyang) were dive bombed by P-40's in two attacks last Thursday. Preliminary reports indicated that extensive damage to the objective resulted. The next day, two B-24's heavily bombed and island, artillery and supply concentrations off Ichang in the Yangtze river. Again Sunday, P-40's in the vicinity of Yochow, concentrated their attack on dock and shipping facilities. All of the planes returned safely from these missions. American ingenuity and improvisation are two strong weapons directed against the Axis. 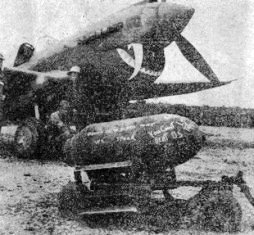 Col. John Barr, of an Assam air base, conceived the idea that P-40's could be converted into "B-40's" and help B-24's and B-25's pound the enemy in Burma with 1,000-pound bombs. Soon his plan became actuality. 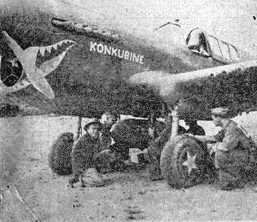 Today P-40's are qualifying as "flying dentists," earning the sobriquet because of the devastating work they have been doing on Tojo's bridges. Accuracy of the P-40's as bombers has been exceptional, as proven by aerial photographs showing twisted, misplaced spans. (Photos by Pvt. Garrett Cope). 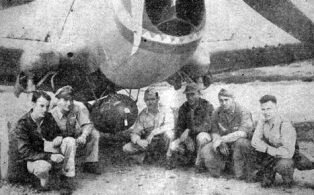 Originators of the 1,000-pound bombing raid with P-40's are, left to right: Lt. J. F. Keith, Lt. H. D. Helvey, Col. John Barr, Capt. E. Nollmeyer, Lt. R. McClurg and Lt. W. E. Bertram. It was primarily Barr's "baby." Although still finless, the 1,000-pound bomb, with appropriate slogan inscribed, looms large before the plane that will drop it. The crew trundles the 1,000-pounder to the "B-40," where it is to be loaded upon bamboo supports. The explosive is raised into position by Pvt. A. M. Zinkevich, Pfc. Paul Farmer, Cpl. E. Warmbrod and Cpl. E. Pence. The delicate job of attaching the fins to the bomb is done after the missile has been placed upon the hangers. Pre-arming the bomb is done by the pilots. Col. Barr is shown attaching the wire to his "present" for the Nips. Last-minute instructions are given by the flight leader. He shows pilots the target on an aerial photograph. The bomb is in place and the plane is ready for take-off. Note the relative size of explosive and P-40. Lt. McClurg climbs into the cockpit. Soon he'll thunder off the runway, roar over Jap-occupied Burma and strike an enemy installation with his single bomb. It takes a long run to lift the load carried by the bomb-carrying P-40's and nerve on the part of pilots the first several times they go out on such a mission. JITTERBUG - INDIAN STYLE Col. Roy E. Bowlen, tetched by the heat, no doubt, goes jitterbug - Indian style. Playing the bean in masterful fashion for accompaniment is Capt. Carl Arnold. WEST INDIA PORT HOSPITAL - Viewed with considerable suspicion have been the number of unaccountable relapses... shortly before date of discharge. Several cynics tie up the return to bed with the three-a-week movies shown patients. Others believe the reason to be the tender ministrations of the nurses. While another faction holds out it's because of the soft mattresses. The chorus of pounding hammers and chewing of saws introduced construction work here. Also - something which looks suspiciously like a swimming pool is taking form and substance. Plus four tennis courts. This is the time of the month when G.I. 's have financial trouble. But the hospital softball team, the Ramblers, has discovered a happy solution. They simply schedule a game with some heavily-striped Air Corps team for a flock of rupees. Two questions of the week: (1) Will we or won't we keep our beds? Those of us who have spring beds and mattresses are viewing with alarm the disturbing appearance of cots in the supply room; (2) Just what is July 16? That date has been kicked around from one latrine to another for a whole week now, and is still shrouded in mystery. CHINA-BASED BOMB SQUADRON - Americans, noted the world over for helping those less fortunate than themselves, have given additional proof of their generosity. Having read of the "adoption" of Burmese and Chinese war orphans by American soldiers stationed in China, three Sioux Falls, N.D., women sent money to this squadron to be given to a nearby war orphans camp. Considering the $5.00 will feed, clothe and house one orphan for a month, the money will do much to help the Chinese carry on their struggle against the Jap invaders. By S/Sgt. JOHN E. CHAPMAN. FLITGUN-WALLAS STAGE NOCTURNAL FIGHT G.I. 's at an Assam base have to rough it even at the movies. Flitgun-wallas in khaki combat nocturnal insects during an outdoor show. Then, after the volatile spray nearly killed the audience as well as the marauders, the projector broke down and there was no picture after all. (Photo by T/4 Martin Layland, Roundup staff photographer). 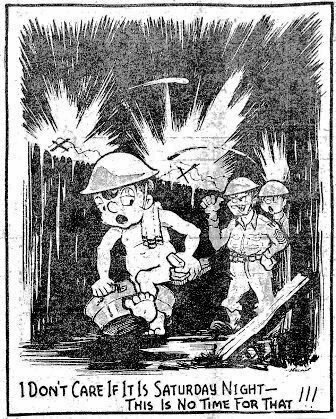 CHINESE-AMERICAN TRAINING CENTER - Bulltown's officers piled into palatial Monsoon Inn at 4 p.m., withdrew at 5 p.m. in favor of the Enlisted Men's dance. Look, Click and Life magazines must have been represented among the 10 photographers who looked, clicked and lived at the dedication of the new service club. Uncle Joe's Greasy Spoon, formerly an outdoor hamburger joint, was transformed into a swank and sophisticated indoor cafe. This highbrow atmosphere affected on son of Brooklyn, who demurely said, "Gimme anudder hamboiger - please." Gallant Miss Hess of the Red Cross hi-ho Silvered to the rescue of jitterbugs, so exhausted they couldn't lift even a hamburger. She held the Greasy Spoon specialty while the boys nibbled. Not an arm was lost. Glasses of weak tea, topped with cotton baton, created drooling chops among unsuspecting chaps. Unsuspecting chaps became suspecting; desirous beer became weak tea; and all became disappointed. Miss Hess did a movie talent scout's job in bringing young ladies to Bulltown from a nearby town. Photographs of the opening of Monsoon Inn reached the Roundup in time for last week's issue (May 27), but this story arrived only recently. Roundup apologizes to the hard-working enlisted men of the Chinese-American Training Center for an unintentional slight in the recent full-page picture spread of the camp and its work. We remarked that American OFFICERS helped in the training of the Chinese troops, neglecting to add... "and enlisted men." Bouquets of praise for these courageous girls who attended the dance. Look at that rough and tumble ride they went through. Sgt. McGrath grabbed the most accomplished dancer to whirl, dip and swing a la Veloz-Yolanda. Suddenly he cracked, went mad in an outburst of grotesque jitterbigging, His partner is alive and well, which is a tribute to modern womanhood. Charming Joyce Radley posed for a pic at the bar. Negatives were positively terrific and we cancelled our orders for Hollywood glamorized photos. WE SAW: Amelia pouting as McGhay ripped out on the keys. No drums for heppy, jive-happy Frankie... Ice cream, cookies and tea on the house. Lippy Lipschultz's five o'clock shadow tickling the girls. Joe T. Bell fronting for Glen Miller's, Tommy Dorsey's and Shaw's bands and winding them, too... Quizmaster Roy Schatt, the poor man's Clifton Fadiman, asking a contestant, "Where was the Battle of Gettysburg fought?" and receiving no answer. Everyone having a gay time, for we haven't lost that American talent of having good, solid fun any and everywhere. PROOF OF THE PUDDING STILL IN THE EATING Before and after aerial photographs graphically prove the effectiveness of the P-40 as a bomber, carrying a 1,000-pound explosive. The target in this instance was the Namkwin Railroad Bridge. CENTRAL INDIA AIR DEPOT - Typewriter jockeys of group HQ moved into new quarters recently, and all personnel now have room to stretch their arms in both directions at once, if such is their want, without punching out the eyes of their neighbors. There is even room for Finance, which had for so long been housed with ASF. The Civilian Personnel Office, dispensary and the dentist's groan shop now occupy the building vacated by HQ. Local laddies are high in praise of Sgt. Jack Bell of the chow department of "The Hangar," our service club. The "steaks" and ice cream are particularly tasty, and the bearers that fastest in India. The hot weather is with us in all its fury, and, as this is written, still another dust storm rages without. Without what, I don't know. But it's within, too, even with all doors and windows closed. Visibility is limited to 100 yards. It's in your eyes, hair... everywhere. Even the Indians are complaining. Another instance of "unusual weather," no doubt. The recent memo sent by OCS has aspiring applicants in a dither again. Whether anything comes of it remains to be seen. It has been over six months since the first applicants appeared before the board, and that's a long time to wait, even in India. Oh, well, 'tis said "everything comes to him who works while he waits." TARGET PRACTICE Flying kites is a serious business with a China-based medium bomb squadron. Left to right, Cpl. Arthur E. Norton, T/Sgt. James R. Johnson and S/Sgt. Edward M. Cooning display target results. 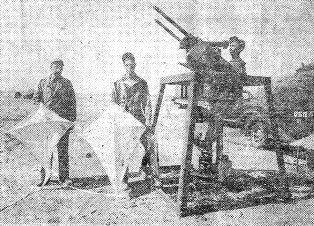 CHINA-BASED BOMB SQUADRON - Flying kites was one of the favorite pastimes of American kids even before Ben Franklin "discovered" electricity. There isn't a G.I. in the Theater who hasn't spent many an hour in the north pasture of the vacant lot down the street, building and flying them - be they a small affair made out of a few bits of paper and string or the elaborate box kites of cloth on a sturdy framework. However, the boys of this medium bomb squadron are flying them for a purpose. Utilizing a turret from a B-25, the squadron has inaugurated a gunnery training program, flying these kits at various heights and under all kinds of weather conditions. The combat crew members have blasted them out of the sky with the heavy machine gun. Many of the boys taking part in the program already have to their credit an impressive score of enemy planes but they just grin and say, "Practice makes perfect." 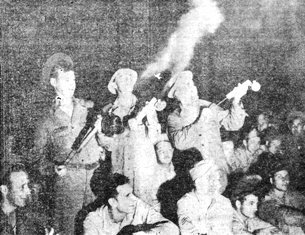 In addition to the combat men, every member of the armament section has fired the prescribed rounds and qualified. ASSAM AIR BASE - For weeks the G.I. 's in Headquarters and Headquarters Squadron - Service Group have been "complaining" (they have a different word for it!) about the amount of "corn willie" served in their thatch-roofed bamboo mess hall. Some even claim that it was seen on the serving line for breakfast one morning. This noon, as the last grouser left the place, Cpl. T. P. Lawrence, 1st Cook, heaved a sigh and said, "Sometimes I wish the Japs would bomb the - place and burn it down so I wouldn't ever have to hear the word 'corn willie' again." At that moment, there was a dull "BOOM," as the cap blew off the gas tank of a field range, and a moment later the whole place was a mass of flame. 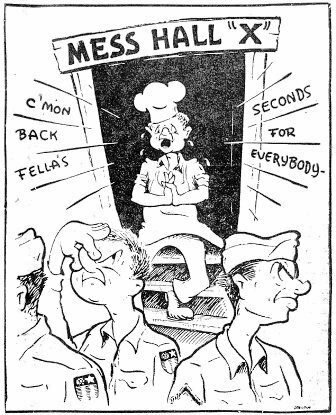 Luckily, no one was injured, but what do you think of a mess sergeant who keeps all his flour, bread, canned fruit and milk in the mess hall and the store of corned beef in a basha 500 yards away? Tonight the boys are eating cold "corn willie" straight from the can - War is hell, ain't it?! - By Pfc. PERRY S. CLEMENT. BRAVERY S/Sgt. 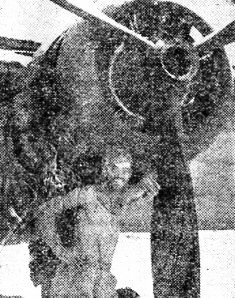 G. B. crandell, member of a combat crew at an advance medium bomber base in India, is pictured in front of the ship saved by his quick thinking and bravery. Fire started in gasoline containers beneath the right engine. At risk of his own life - knowing the full wing tank might explode - Crandell released the brakes so the plane might be moved from above the containers. "Uncle Joe's Chariot," Gen. Joseph W. Stilwell's personal DC-3, is believed to be the first plane to fly the 2,002 miles from Chungking to New Delhi without an overnight stop enroute. Piloted by Capt. Emmett Theisen, with Lt. Harry Koral as co-pilot, the ship took off from Chungking at 9:30 a.m. last Sunday, hopped the Hump, stopped for gas in India and arrived in New Delhi at 1:30 a.m. Monday. Two stops were actually made in India as, for some unknown reason, the gas truck couldn't be located at the first field visited, which caused the crew to fly to another field in disgust after waiting two hours. A CHINA AIR BASE - Here's good news for G.I. 's stationed in the wild and wooly Orient! We're proud to be able to report that the ladies of Ashland, Ore., are doing their bit for us. S/Sgt. Bob Monroe received word last week that the girls in his home town are now collecting costume jewelry to send us. The jewelry, the ladies naively explain, will enable us to barter with the natives. But, girls, the natives are friendly. And you should know, ladies, what we'll get in return for your costume jewelry. Why, sure - more costume jewelry. By S/Sgt. 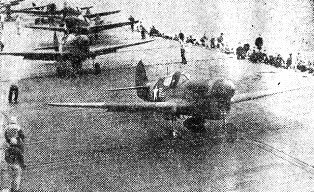 ROBERT E. BADGER.
. . . OF ALL PLACES Of all unusual places, P-40's are about to take off from the deck of an aircraft carrier. 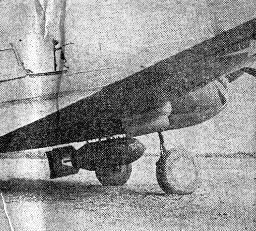 Note the extra gasoline tanks for the planes, usually land-based. AMERICAN AIR BASE IN ASSAM - American doctors and nurses from the Rhode Island Hospital at Providence have won their first battle against the jungle and primitive living conditions prevalent at this base. They arrived recently during a typical pre-monsoon storm and almost tearfully eyed the bare clearing surrounded by dense water-sweating jungle, where American engineers were rushing work on bamboo houses. Not waiting to unpack their supplies, however, doctors and nurses threw themselves into the work and within a few days the were grudgingly called "smart jungle rats" by the engineers. There is little to capture the imagination here as far as the alleged romance of the East is concerned, but the camp is the pride of most of the hospital unit, built with their own hands. I trudged through ankle-deep mud under a pelting rain, watching the bright and cheery nurses, clad in khaki trousers tucked into rubber boots and G.I. raincoats, continuing their work. Under the bamboo eaves, they were washing clothes in tin helmets and buckets, their hands still raw from chopping wood and pumping water. Two other nurses were repairing a brick walk leading across the morass from their quarters to the main path, which the men had constructed with gravel from a nearby dump. Ten feet from the edge of the camp was the jungle, but the girls had few fears. "We hear wildcats at night occasionally and the men tell us tigers have eaten cattle in the hills back of the camp, but we don't worry any, even about the snakes," Miss Thelma Sanders, a tall blonde from Seekonk, Mass., told me. Using the few available materials, the nurses have made their quarters as homelike as possible. Christmas and Valentine cards, pictures of families and sweethearts at home, ghurka knives and gaudy calendars decorate most of the rooms. They painted signs such as "Gee-Too," and "Bide-a-Wee" to identify individual quarters. At present they sleep on cots, but have hopes of obtaining hospital beds. "It isn't so bad, but I ruined my finger-nails building my own furniture," mourned Miss Eileen MacHenry, a Canadian-born girl who now lives in Providence. Her wash stand and dresser were on the rickety side, but definitely were usable. The officers built their own club, purchasing rugs, bamboo furniture, shades and contributing magazines, books and a portable phonograph. They have a cooperative bar. Once or twice weekly a small quantity of Indian liquor, generally gin, can be purchased, and drinks are served on a pro-rata basis. So far the quota has never exceeded two drinks a night. Maj. Abraham J. Meister, 33, of Lowell, Mass., who is executive officer of the unit, found an abandoned 250-gallon tar cooker and after a lengthy battle converted it into a water purifier. He also constructed a simple but effective sewage and garbage disposal plant. The unit used as much care in constructing a kitchen as in building a surgery, and through use of gauze and mosquito net made it into one of the most sanitary kitchens this correspondent has seen. Col. Charles L. Leedham, 40, of Clinton, Ia., a 15-year veteran of the Army and commanding officer of this unit, told how the enlisted men who had been through the Tennessee and other maneuvers before coming across had swung into the camp and gone to work. "We didn't see them for two days, they were so completely in hibernation," he said. "But when they came out, they had fixed their tents into the best living quarters possible. They knew what to do and did it without any help." DEADEYE Sharp-shooting Pvt. Robert Skanter of an advance bomber base in India sets his sights on another horseshoe ringer. Pride of the enlisted men is a "jungle garden" constructed by Cpl. Leighton J. Heller, of Clementon, N.Y., a pre-war lawyer and mayor of Clementon. He used bamboo for arbors, bamboo baskets for garden seats, jungle plants and then constructed a small network of gravel paths in his off-hours. Activation of the unit on Aug. 17, 1942, "almost decimated" the Rhode Island hospital according to Col. William A. Mahoney, Providence, who is chief of the medical service. Younger men were promoted and retired surgeons were called back, while others unfit for Army duty carried a double load. EAST INDIA BOMBER BASE - When Pvt. Robert O. Skanter takes time out from his work in the engineering department to pitch horseshoes, it's just too bad for the rest of the barnyard golf devotees in this neck of the woods. Skanter, winner of many tournaments in the United States, walked away with both the singles and doubles championships during the recent base competition. His doubles partner was Pvt. Stanley B. Miska. It's the exception, rather than the rule, when the champ doesn't throw a ringer. - By Lt. ALEX J. PORTER. CALCUTTA - America isn't the only place where prices are going up. Today I paid three rupees, eight annas (about $1.10) for a tube of American-made toothpaste which sells in any U.S. corner drug store for 25 cents. In Cedar Rapids or Seattle, price rises are calculated in percentages. Here it is in multiples. In November, 1941, the price of rice, the diet basis for Calcutta and eastern India, was the equivalent of $1.60 per maund (about 80 pounds). Today, a maund sells for $10. 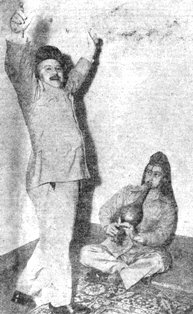 "Before the war my monthly salary left me about 50 rupees ($16) spending money for my family and myself. Now, I barely manage to pay the food bill and can't even think about clothes and entertainment." Hoarders and profiteers, though not entirely responsible for sky-rocketing prices, are making a clean-up. Japanese vacuum bottles sold before the war for $1 and cannot be had now for less than $10. The Bengal government's attempts to assist the lower income group have been only partially successful. Defense plant workers and government employees are receiving 15 to 50 percent dearness allowance on their salaries. "When we can get it, we usually have to pay $20 for a bottle of good Scotch. The Indian stuff rots your stomach and still it costs $7 a quart. Price labels on American canned goods are fantastic. A small tin of chicken soup sells for $1. Shorts which can, when available, be purchased from the Army for 50 cents, cost $3 in any shop. Razor blades are $1.20 for a package of 10. "The British may kick because our boys get paid more than they do, but what do we get for our money?" - By a United Press War Correspondent. WHY, IT'S THE VICEROY Duration Den patrons almost blas� they've had so many important visitors, showed only mild interest at first when Maj. Gen. Clayton L. Bissell, center, arrived with a guest. But when G.I. 's learned the general's friend was Lord Linlithgow, Viceroy of India, THAT was another matter. Cpl. Arthur B. Scott was one of many to get an autograph. Under the glare of flash-bulbs, amidst the importuning of autograph hunters and to the tune of camera-clicks, the servicemen's Duration Den played host to Maj. Gen. Clayton L. Bissell, Commanding General of the Tenth Air Force, and to Lord Linlithgow, Viceroy of India. The Viceroy was met at the servicemen's club entrance by Bissell and the general's aide, Capt. Luther Davis, and was taken on his initial tour of this G.I. recreation center. The evening's conversation covered everything from American hamburgers to the Viceroy's avid interest in the Roundup (even to its cheesecake). The keynote of the evening, however, and one which typified the Den's true tone, was struck by a G.I. when the Viceroy was being introduced to some of the soldiers who happened to be present. It was a casual note, yet one of cordiality and hospitality. "Pleased ter meetcha, Mr. Viceroy," drawled the soldier, as he proffered his hand. CANDIDATE CUDNEY'S COLLAPSE - When S/Sgt. James Cudney was sweating out his return to the States as an Officer Candidate, he continually harped on his big plans for the furlough he would have at home just before being sent to school. His dreams took in everything from high parties to intimate dates with wolfish women who wildly waylaid wandering G.I.'s. Jim expected to spend all of his pre-school furlough being waylaid. This week, Sgt. Lunnie (Foots) Willis received a letter from Candidate Cudney, now back at home, in which Cudney states that when he got to his station "they slapped me into a hospital as soon as they found out where I had come from and how long I had been back. I guess they decided I needed a little rest before I started school." So, from a hospital bed in America, Candidate Cudney continues to plan. 'SWEET' RELATIONS WITH CHINESE CADETS American bomber crews based in China gnaw sugar cane between halves of a recent basketball game with Chinese cadets. Using a fast break and screening to good effect, the Chinese won, 27-17. Americans in the picture are, left to right: Standing - Lt. Merle Jones, Lt. John Wahl, Lt. Arthur Karp, Sgt. 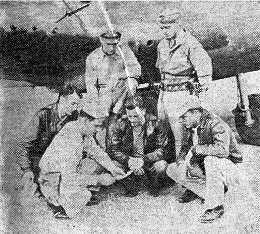 Glenn Zimmerman, Lt. Mathias Quakenbush, Lt. Morton Salk and Lt. Charles Thompson; kneeling - Capt. 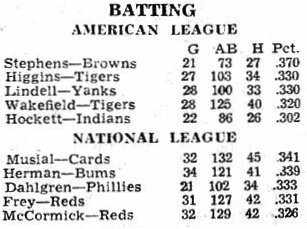 Harry Musinski and Lt. Mark Conn.
NEW YORK - Vernon Stephens, St. Louis Browns shortstop, returned to action and lifted his average two points to .370 for a clear-cut lead in the major league batting race. Stan Musial's .341 was the National League's best. Back, at last, from a tour of the hinterlands which carried us as far east as Chungking and gave us a quick view of what's what in Assam - a province we hadn't seen since last June. Normally this hole in the paper is filled with nonsense about something or other, but this time we want to bring to the attention of the body politic, a mess operated on a former athletic field in Assam which handles several hundred transients weekly. We regret that, due to censorship restrictions, we cannot name the organization running this mess. We regret this because the mess is a disgrace to the military establishment, and the Roundup has always believed in giving credit where credit is due. The Roundup representative and another officer arrived at "X" on Sunday afternoon, May 23. There had been no rain that day and what mud was about was largely confined to roadways and a few isolated spots on the grounds. The remainder of the grounds were covered with a firm turf that left no mud on shoes. Yet when we entered the mess for dinner that night the filth on the floor was incredible. The food, which consisted of salmon, watery mashed potatoes, and spinach, was served floating happily in a half inch of greasy liquid. The officer traveling with the Roundup representative refused to eat his but we ate ours and are still marveling that we escaped gastric ulcers. "Hell - you think this is lousy! You should have seen it before. At least we don't get sick any more after eating here." We questioned several officers in authority about the condition of the mess and invariably got the reply, "We just haven't got the personnel to do anything about it." A check of personnel brought to light the fact that the mess is operated by one officer, 11 enlisted men and 35 Indian servants of one class or another. We consider this sufficient to sweep the floors. Nobody in a theater of operations expects to eat crepes suzette and pate de foie gras served on delicate Ming china. Nobody expects old Rhine wines served in crystal goblets, but everybody, enlisted man and officer alike, is entitled to clean food served in an efficient manner in an establishment at least reasonably free from dirt. "X" has had a Theater-wide reputation for a long time. There has been some little official correspondence about the whole thing, but results seem to be confined to correspondence and, possibly, good intentions. The normal alibi, as in this case, is that a great influx of transients were suddenly loaded on the place and that, after all, others should be responsible for the handling of such large groups. It is pointed out that with such "limited" personnel it is impossible to run a decent mess at "X." It may be impossible to keep from running out of chicken when 200 people are suddenly dropped in your lap, but floor space remains the same regardless of customers, and concrete floors aren't the most difficult things in the world to keep clean. We are prepared to admit that the personnel may be "limited" but not in numbers. There is nothing wrong with the mess at "X" that a few bustings and a reclassification board can't straighten out.